I know lots of people here have been on Cloudland Road and admired Sleepy Hollow Farm. We checked it out on Sunday and were super excited to see that the house has been painted a wonderful shade of deep red and it make the scene there awesome. I need to look at some old photos but I think they also removed some trees that used to be in front of the house. The gate was also open this year which was nice to see! Mmvt, was there today and two thumbs up for the new paint! Beautiful shot, hope mine turns out as well! Looking forward to seeing your photo Janice- I am guessing the color was even better when you were there! I think the new paint color on the house really makes this scene more "complete"! I wish i had more time to spend there but it was the end of a long day and we had a maple creamee date with other friends we were meeting. My photography friends from home were super excited to shoot all kinds of things on Cloudland Road (along with several other people who made their way to the road)! It looks better now. If I have time this Saturday, I'll try a pic. Yes, Andy - it makes a HUGE difference in the overall photo. When you update your book you may also want to include that parking anywhere on Cloudland can be pretty difficult We encountered about 5 different places where cars parked in ways that blocked traffic and created problems for others. the area right at Cloudland was almost impassable at one point because some people seemed to simply pull over and jump out of their cars without might awareness that they were blocking others! We also encountered someone using a drone that they were flying at a very low level and quite close to the places on the property! Hi everyone! I am new on this board. I started reading it about 4 weeks ago. I spent last Thursday, Friday and Saturday (10/13-10/15) in Woodstock! Thank you so much for letting me know about Cloudland Road and Joe Ranger Road. They are incredible!! Here is a shot I took of Sleepy Hollow Farm! mrcpa: Welcome to the forum! so glad you had a great experience in Woodstock! I spent my first weekend there and thanks to Miinnesotaman fond Joe Ranger, my absolute favorite! I have been on Cloudland, Galaxy and Old Kings Highway before with another forum member Phil, who is on his way to Florida soon. Thanks for the lovely picture of Sleepy Hollow Farm. I passed by with bm and didn't even note the red color. Too bad for me! Hope you had a great rest of the trip in Woodstock and would love to hear more about your adventures in that great town! Glad you enjoyed Cloudland Road - it seems the color there has held up very nicely and is much brighter than it has been in a very long time! Sleepy Hollow is such an iconic VT Farm scene and the newly painted house really completes the overall picture. mrcpa, you make us all wish we could spend the entire season in Vermont checking out the progression of color continuely ! Every photo I see here I wish I could've been there! Sorry I took so long to write back. I am from Stamford, Connecticut! I work in 30 Rock in midtown Manhattan. I hadn't been to Vermont in over 15 years. I decided several months ago that I wanted to go the Woodstock Vermont area for some fall photography. I arrived in Woodstock on 10/13 and left the morning of 10/15. In between, all I did was take pictures! I went to Jenne Farm, downtown Woodstock, Cloudland Road, Joe Ranger Road, Quechee Gorge, East Barnard, Barnard and alot more. I found out about all of these great places through this forum. Thank you so much for the information! Check out the Vermont gallery. Currently (10/27) I am still waiting for Central Park to reveal it's fall colors! We had rain last weekend and are having alot today. Tomorrow will be very windy. I hope there is something left by the middle of next week. That's when it should be at peak color! 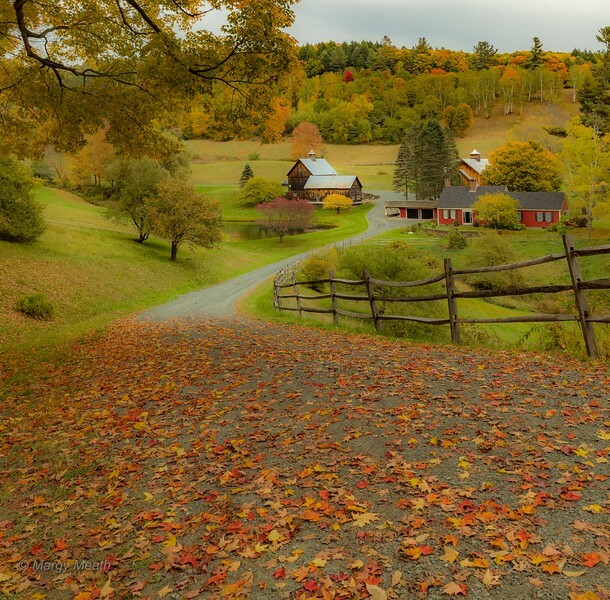 Nice collection of Fall Vermont images Sheldon. Thank you very much for following up and sharing them with us. Have a great time photographing Central Park!